This month we've highlighted 5 teachers who have received exciting features and recognition. Check out October's roundup of teacher spotlights. Illustrator and Designer, Neesha Merani was featured in The PigeonLetters, for her work with kids and creativity. Learn how to draw wildflowers with Neesha in her Ink Class. Fine Artist LaurieAnne, was featured in Jenny’s Print Shop for her original sea landscape collection. Learn how to paint abstract landscapes with LaurieAnne in her Acrylic Class. 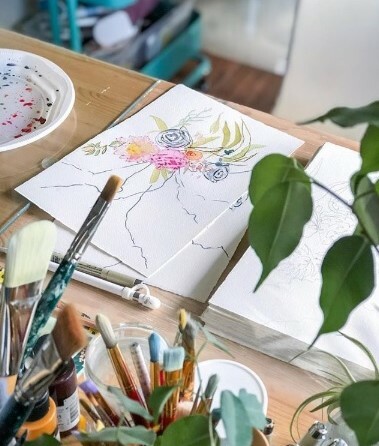 Watercolor artist Jean Lurssen, was featured in DoodleWash, sharing her her story and personal inspiration as an artist. Learn more about Jean’s process in her class, Painting Abstract Watercolors. Graphic Designer Kristy Brown, was featured on the NCS blog for her logo design work. Learn how to use the pen tool in Illustrator in Kristy’s Digital Drawing Class. Son Hans’s accounting class was featured on Forbes.com. Learn basic accounting principles with Son in his One Hour Accounting class. Have you been acknowledged or featured outside of Skillshare? We want to hear about it! Fill out this form to let us know how you or your work has been spotlighted.